Final song as they leave the now destroyed CDC. The remaining survivors of the camp leave the campsite. 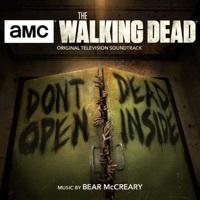 Music as Daryl is contained in his cell. Dwight brings him some food and locks the door behind him. Rick starts shooting Dave and Tony. Is Emma Russack among the Walking Dead S9 e11 Bounty soundtrack? Thanks for your response..
What is the Name of the Ending and Beginning song of the last episode?